Later models of the formula have proven to be safe, stable fliers, and a long-winged variant, built for a flight from Long Island, New York to Le Bourget, France is an extreme example of not only tandem wings, but of aerodynamics and energy generation. Raphael Dinelli, a world sailor and navigator showed off his Eraole “a few steps from the climate conference in Le Bourget” last week as part of COP 21 presentations. Dinelli, a former competitor in the Route du Rhum race across the Atlantic in November, and at least four single-handed voyages around the world in Vendée Globe competitions, is no stranger to the hazards of large bodies of water. During one Vendée race, his boat capsized and Raphael was rescued by Peter Goss, a British sailor awarded the Légion d’honneur for his bravery. Goss turned his boat around and sailed two days in near hurricane winds to find Dinelli in his life raft, reportedly waiting with a bottle of champagne ready. Dinelli will fly Eraole in calmer skies over hoped-for calmer seas on sunlight (25-percent), 280 liters of bio-diesel oil (55-percent) developed by Laboratoire Ocean Vital, and energy from “soaring,” which seems to refer to the airplane exploiting its maximum glide angle at its best gliding speed. Dinelli heads a far-ranging group working with applied research and demonstrating uses of green energy with their decarbonized airplane. ADP (Aéroports de Paris), an umbrella organization for airports around Paris, provides partial funding for the project. 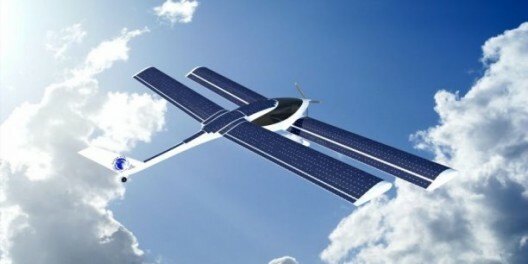 Solar cells topping the craft’s four wings are made by the Laboratoire, and feature 24-percent efficiency, a weight of only 0.226 pounds per square foot (1,100 grams per square meter), and a thickness of only 0.6 millimeter (0.236 inch). Sandwiched in a patented composite material, the 1,728 patented solar cells have been shown to withstand a simulated 25 years of use with a loss of only one percent in performance. Their flexibility allows conformance to Eraole’s wing surfaces. Eraole and its solar cells are two of five research areas for the Laboratoire, the other three being small vertical wind turbines, environmentally responsible housing, and green sailboats, using wind and solar power to navigate, much like the team’s aircraft. 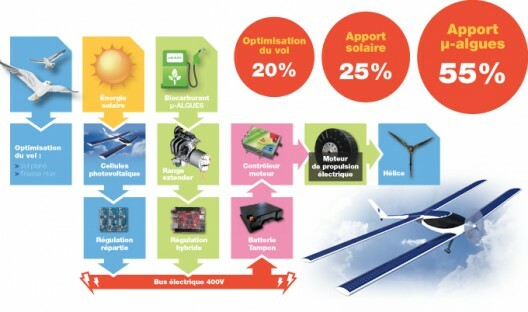 Solar cells will charge two packs of 12 modules each of TYVA Energie batteries with an output of 345 Volts. Further charging will come from a bio-algal-fueled small Diesel generator. All this energy is collected and controlled over a 400-Volt capable bus that directs energy to the Emrax motor, which will put out a maximum of 140 kilowatts (188 hp) and cruise continually at 50 kilowatts (67 hp). Next January, the first Eraole tests will take place in Pontoise, a few kilometers north-west of Paris. Training for the mission is a major undertaking for Dinelli, who says “I’ll feed me nuts” (terrible translations being rife on the Internet) and who will need to stay alert for the 60 hour voyage, almost twice the duration of Lindbergh’s crossing in 1927. That’s due in part to Eraole’s “economic” speed of 65 kilometers per hour (40.3 mph) and 140 kilometers per hour (86.8 mph) in cruising mode. He also says he needs to lose three kilos (6.6 pounds) to keep the craft’s maximum takeoff weight to 825 kilograms (1,815 pounds). Lindbergh flew the 3,633 mile route in 33 hours, 30 minutes, 29.8 seconds, averaging over 108 mph. He had not slept the night before, landing in Paris having endured 55 sleepless hours. Dinelli faces not only the need to stay awake but to prevent hazards even fliers on long-distance airline flights encounter – deep vein thrombosis and pulmonary embolism. Bertrand Piccard and Andre’ Borschberg in Solar Impulse fight the same health issue, and their regimens of yoga, exercise and the ability to change positions during flight help counter the problem to some extent. Dinelli has a more rigid, but probably still comfortable position judging from pictures of the seat in Eraole. The project has received assistance from ONERA, the research organization of the French aerospace industry, andheo engineering consulting, and Electravia for the design and manufacture of dedicated propellers. Additional support has come from EMC2, a consortium of technology and manufacturing firms, and Tenerrdis, a broadly-based clean energy consortium of academic and manufacturing entities. Follow Raphael Dinelli and his Laboratoire on his Facebook page. some small amount of cabin heat may be captured from the EMRAX motor, if careful air ducting is installed.